Soul's Harbor | "…helping men help themselves and break the cycle of homelessness…"
Addiction is a lonely disease. Family and friends want no part of it and the drug addict and alcoholic isolate themselves – feeling remorse, guilt, and hopelessness. The addict and alcoholic are in a downward spiral that can lead the men to lose everything and become homeless. Soul’s Harbor opens its door to all homeless men with substance abuse issues into a very caring, inclusive and loving community. We have a common bond in our brokenness. 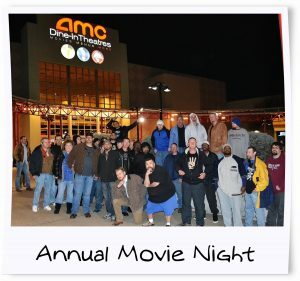 We demonstrate to our men that they can have fun in recovery – whether at a Texas Rangers game, pool tournament, basketball pickup game, talent show or a night at the movie theater. 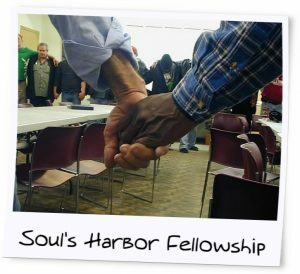 Soul’s Harbor has been providing a caring community for homeless men since 1956. So why is Soul’s Harbor so effective at keeping men sober? The answer is – the longer you stay sober, the better the chance you will stay sober. Sounds fairly intuitive. However, many programs are 1 or 2 months long which barely gets the addict or alcoholic off their drug of choice. Soul’s Harbor program is 6 months long followed by its aftercare program called the “Exit Plan Strategy”. Our Exit Plan Strategy is another 9 to 12 months. 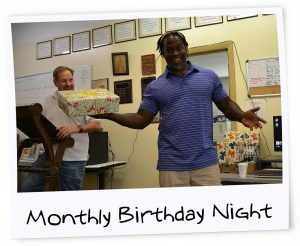 Residents that complete both our 6-month program and Exit Plan strategy has a very high success rate of long term sobriety. Our Recovery Program at Soul’s Harbor is modeled after expensive treatment centers. We take “best practices” from these treatment centers and offer them at “no charge” for our community of homeless men. We treat the recovery program as a “school in recovery”. Our men are enrolled in cognitive courses, relapse courses, relationship courses and other approaches to recovery. We offer Alcoholic Anonymous, Narcotics Anonymous, Cocaine Anonymous, Celebrate Recovery and optional Bible Studies. To learn more about our holistic approach to recovery, go to The Harbor Program. Below is a 13-minute video testimonial from one of our residents who successfully completed our 6-month recovery program. Reggie is our Assistant Director and is still working his program by being free of drugs and alcohol since April 2010. To help Soul’s Harbor financially you can donate by clicking the donate button. Thank you so much for your financial consideration. Note, your tax-deductible contributions may also be submitted through PayPal to gro.s1556253029allad1556253029robra1556253029hsluo1556253029s@eta1556253029nod1556253029. *Please note: Users of Internet Explorer 8 and above may experience difficulties with our PayPal “Donate” button. Please access PayPal directly to make a financial contribution to Soul’s Harbor, Inc. Thank you!